It is evident that prime minister Modi’s ambitious strides in search of a 'New India', coupled with his government’s disdain for welfare, are leaving the basic lifelines of the poor far behind. Prime Minister Narendra Modi talks of a ‘New India’ that will “make Gandhiji and Babasaheb Ambedkar proud”. One can take a ‘I am New India’ pledge on his website and mobile application. According to this pledge, New India is characterised by peace, unity, brotherhood and freedom from corruption, terrorism, black money and dirt. While all of these are worthwhile ambitions, the pledge is questionably silent on the gross deprivations faced by a majority of the country’s population. 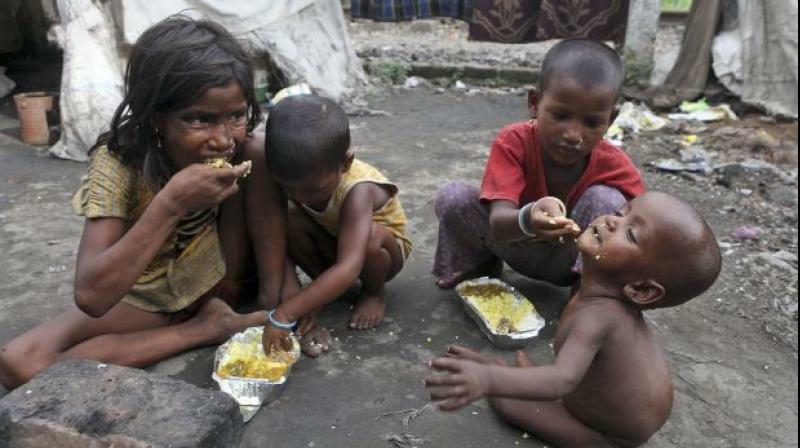 One would expect that in a country plagued by the ‘unfreedoms’ of hunger, undernutrition and poor health, the fulfilment of basic needs would rank high in the vision for a ‘New India’. For at least nine people across the country, these ‘unfreedoms’ have culminated in their death in the last few months. Five of these deaths happened in BJP-ruled Jharkhand, a state on its way towards becoming the ‘New Jharkhand’ as claimed by its chief minister Raghubar Das. All the families that lost thier members due to hunger lived in extreme deprivation and routinely suffered from shortages of food and nutrition. For example, it is not uncommon for Garhwa district’s 67-year-old Etwariya Devi’s family to survive only on a daily meal of rice and salt or to end the day with a hungry stomach in the absence of adequate grains at home. They have to borrow food from neighbours at times, provided the neighbours have the grain to spare. The family has not eaten dal for the past several months, as prices of pulses have skyrocked. In the absence of adequate work in the village, Etwariya’s son has been forced into distress migration. Over the past few years, the family has taken loans of around Rs 3,600 that it is unable to repay. It is also yet to pay the local desi doctor Rs 1,000 against medical expenses incurred in the last one year. The state of semi-starvation of these families intensified after disruptions in delivery of rations under the Public Distribution System and social security pensions, eventually leading to the death of a family member. And, for at least four of these families, Aadhaar, a key element of the prime minister’s vision for ‘New India’, was instrumental in causing this fatal discontinuation of services. Simdega district’s Santoshi Kumari’s family was denied grains for five months as its ration card was cancelled in the absence of its linkage with their Unique Identity (UID) numbers. Ruplal Marandi of Deoghar did not get ration for two months as he was unable to authenticate his fingerprints at the electronic point-of-sale (PoS) machine (for Aadhaar-based biometric authentication). Garhwa’s Premani Kunwar succumbed to starvation after she was denied her ration for two months. Etwariya Devi of the same district passed away after the shortage of food in her family worsened when it did not receive her grain entitlements for three months before her death. In both Premani’s and Etwariya’s cases, the ration dealers did not give them grains citing glitches and is said to have fudged the Aadhaar-based digital transaction records to hide the accumulated stock of grains with him. Premani’s old-age pension for the last two months went to someone else’s bank account that got linked with her Aadhaar without her knowledge. Etwariya could not withdraw her pension for the last month from her Aadhaar-linked bank account as internet connectivity disrupted when she was authenticating her thumbprint at the PoS machine. In blatant violation of multiple orders of the Supreme Court that prohibit making Aadhaar mandatory for public services, the central government has made Aadhaar essential for claiming welfare entitlements either through notifications or on the sly. This is leading to violation of the constitutionally enshrined right to life of people. Aaadhar-enabled violations are not limited to Jharkhand. In July 2017, three brothers died of hunger in Karnataka after they were denied rations for six months for not possessing UID numbers. A 50-year-old paralysed woman starved to death in Uttar Pradesh in November 2017. She was denied her grain entitlement for a month as she could not go to the fair price shop to authenticate her identity in the PoS machine. These deaths are just the tip of the iceberg of the number of people for whom hunger has worsened because of these disruptions in welfare programmes. The right to life has been interpreted to mean not just mere survival, but a life of dignity. This understanding forms the basis of the National Rural Employment Guarantee Act (NREGA), the National Food Security Act 2013 (NFSA) and multiple Supreme Court orders that together make access to basic services such as food, nutrition and employment guarantee legal entitlements. While these legislations and court orders are far from providing sufficient economic protection to the poor, they are important lifelines to just stay alive. It was hoped that, over time, these legislations will be built upon, but central government’s insistence on their linkage with Aadhaar has instead weakened them. Also, they are not even being implemented in the spirit in which they were enacted in the first place. The families of Santoshi, Premani and Etwariya could not access their right to work, as NREGA was almost non-existent in their villages. There is also a visible effort by the government to dilute the basic principles of welfare. For example, instead of increasing the quantum, coverage and timeliness of social security pensions, the government seems to be focusing more on contributory pension schemes, such as the Atal Pension Yojana. It is evident that Modi’s ambitious strides in search of a ‘New India’, coupled with his government’s disdain for welfare, are leaving the basic lifelines of the poor far behind. In this journey, the prime minister would do well to remember Gandhiji’s talisman – before taking any action one should always contemplate whether the action will “lead to swaraj for the hungry”. Siraj Dutta is based in Jharkhand and has been working on the MNREGA for the last six years.